January 1 has come and gone and spring is right around the corner, with a brand new golf season not far behind. Did you swear that you would get serious about improving your golf game in 2013? If so, here’s a training program you can attend close to home. Just as Major League Baseball players head to sunny climates for spring training along with PGA and LPGA Tour players revving up for the beginning of their golf seasons this month, you can head to one of 165 GolfTEC improvement centers in the U.S. and Canada, including 68 of them within Golfsmith stores. 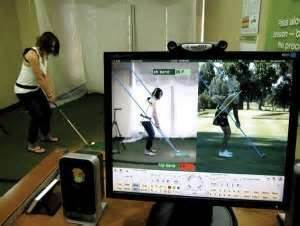 GolfTEC “Training Camp” begins with a complete swing evaluation by a GolfTEC Certified Personal Coach, all captured on video with sophisticated motion measurement technology. The information gathered is evaluated and followed up with a series of 10 private lessons inside specially equipped GolfTEC training bays. Then, 18 hours of video-based practice is worked into each golfer’s individually programmed “Training Camp” schedule. How does it work? Digital video motion and measurement identifies body positions at 24 different points in the swing and is the key component in GolfTEC’s proprietary g-SWING system. A simple color-coded display identifies swing flaws and guides instructors where to initiate and reinforce swing changes. Lessons don’t end there: using the personalized, online Player Performance Center, students can review their lessons—including full video along with the coach’s instructions—at any time via the Internet. GolfTEC has a 95 percent success rate among its students. All GolfTEC lessons are taught one-on-one in private, indoor bays that maximize the learning experience. GolfTEC utilizes proprietary teaching technology and the skills of its Certified Personal Coaches to help golfers improve their skillsets and increase enjoyment of the game. “Training Camp” is not for those who want to sit at home dreaming of better golf while lounging on the couch, or even watching Tour golf on TV. And it’s not as simple as just taking a lesson; it will take real effort. Golfers who report to “Training Camp” will see the difference – particularly on their scorecard, all season long. And the price is a very reasonable $879. New golf clubs promising miracles that never manifest themselves can be much more expensive; add to that the dozens of golf balls you lose – at about $50 or so a pop – and the expense is well worth it…..not to mention the accolades you’ll receive from your new status as King or Queen of the Greens. For more information, visit http://www.golftec.com/trainingcamp or call 877/446-5383.